Schematic of creating a space-time crystal. a, A possible structure of a space-time crystal. It has periodic structures in both space and time. The particles rotate in one direction even at the lowest energy state. 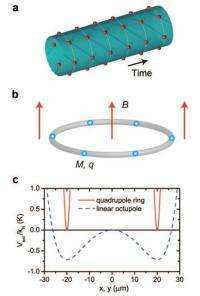 b, Ultracold ions conﬁned in a ring-shaped trapping potential in a weak magnetic ﬁeld. The mass and charge of each ion are M and q, respectively. The diameter of the ion ring is d, and the magnetic ﬁeld is B. c, The pseudo-potentials (Vext) for a 9Be+ ion in a quadrupole ring trap (solid curve) and a linear octupole trap (dashed curve) along the x or y axis. See arXiv:1206.4772v1 paper for details. (Phys.org) -- Earlier this year, theoretical physicists Frank Wilczek, of MIT put forth an idea that intrigued the research community. He suggested that it should be possible to construct a so called space-time crystal by adding a fourth dimension, movement in time, to the structure of a crystal, causing it to become an infinitely running clock of sorts. At the time, Wilczek acknowledged that his ideas on how to do so were inelegant, to say the least. Now another international team led by Tongcang Li has proposed a way to achieve what Wilczek proposed using a far more elegant process. They have posted a paper on the preprint server arXiv describing what they believe is a real-world process for creating an actual space-time crystal that could conceivably be carried out in just the next few years. Wilczek thought that it should be possible to construct a space-time crystal because crystals naturally align themselves at low temperatures and because superconductors also operate at very low temperatures; it seemed reasonable to assume that the atoms in such a crystal could conceivably move or rotate and then return to their natural state naturally, continually, as crystals are wont to do as they seek a lowest energy state. He envisioned a rotation with a ring of ions that flowed separately rather than as a stream, likening it to a mouse running around inside of a snake laying as a circle. The bulge would flow, rather than the snake itself spinning and would just keep on going, potentially forever. The problem was, he couldnt figure out how such a crystal structure could be created in the real world. Taking Wilczeks original idea, but not his method for creating a real world example, Li et al, suggest that to create a space-time crystal all thats needed is a better ion trap. They believe that if ions could be forced using such a trap, into a ring at very low temperatures, as a superconductor, all that would be needed would be a little nudge from a tiny bit of a magnetic field to cause the ions to begin rotating as a single ring. Because there would be no resistance, and because of their natural mutual repulsion, the ring should then continue rotating indefinitely with no additional injection of energy, resulting in the space-time crystal that Wilczek imagined. The team is quick to point out, for those that might be making the jump, that the result would not be the mythical perpetual motion machine because no energy could be extracted from the space-time crystal. They do believe that building an actual space-time crystal should be possible though, in the near term if a future team has the funds necessary to overcome the difficulty of creating a better ion trap. Great progresses have been made in exploring exciting physics of low dimensional materials in last few decades. Important examples include the discovering and synthesizing of fullerenes (zero dimensional, 0D), carbon nanotubes (1D) and graphene (2D). A fundamental question is whether we can create materials with dimensions higher than that of conventional 3D crystals, for example, a 4D crystal that has periodic structures in both space and time. Here we propose a space-time crystal of trapped ions and a method to realize it experimentally by confining ions in a ring-shaped trapping potential with a static magnetic field. The ions spontaneously form a spatial ring crystal due to Coulomb repulsion. This ion crystal can rotate persistently at the lowest quantum energy state in magnetic fields with fractional fluxes. The persistent rotation of trapped ions produces the temporal order, leading to the formation of a space-time crystal. We show that these space-time crystals are robust for direct experimental observation. The proposed space-time crystals of trapped ions provide a new dimension for exploring many-body physics and emerging properties of matter. Seems like a Rube Goldberg system to me. i love how our technology is getting close and closer to what weve only been dreaming of the last many years. I'm bracing myself for references to the Time Cube. While it wouldn't be a perpetual motion machine it could be a perpetual information storage device* with exceedingly high data density. Of course you'd destroy the information state when reading from it, so it would be a 'write-once-read-once' type of device. *that is: if you can keep it at superconducting temperatures without any energy expenditure. And I'm not aware of any tech that can do that. This was my thought too. It's only "perpetual" if you keep a steady flow of energy going into the device to keep it in the superconducting range. And even then, attempting to pull energy out of the system would immediately destroy it. Because of this I have no idea what the practical applications of this idea are, but it sure is neat:). And I'd be willing to bet some enterprising physicist can come up with a weird idea to use it for something eventually. "*that is: if you can keep it at superconducting temperatures without any energy expenditure. And I'm not aware of any tech that can do that." You might try sending it far into space. After the initial cost of delivery, refrigeration is free, if your superconducting device operates at 3 plus/minus Kelvin. Much like with a superconducting ring: If you have a cheap way that keeps the superconducting state alive (e.g. by burying a 'high temperature' superconductor on the Moon) you can create a very efficient energy storage device which will keep its charge basically forever until it's needed. Much better than batteries which will go dead eventually. If you do this for the proposed space-time crystal, then you could construct a data-vault that would keep its data alive indefinitely and could be read out very efficiently when needed (albeit only once). i don't see the point of this at all, it has no use, its not even a theory. Also i was a bit misled by the title i thought it was suggesting a crystal made from space-time itself, what use that would serve i don't know and its probably impossible sci-fi nonsense anyway. "Space-Time" appears to just be a fancy name. As far as it being purely an academic exercise, what's wrong with that? Science exists to discover, and this is a discovery. Progress is not made by people who simply ask "why", but rather follow that up with "why not?" This has no moral quandaries, not potential for misuse, and it unlocks another mystery of what is possible in our universe. Science has an interesting habit of discovering incredibly useful answers while trying to find really trivial ones. No one was trying to develop a sci-fi level building material when they discovered carbon nanotubes, it was a happy "oops." So they are talking about ions moving inside the superconductor ring in a circle. What keeps the ions moving in a circle as opposed to a straight line? I.E. What makes them turn? Does the superconductor need to be a circle? What if you make it a square? Would this still work? I'm guessing that the superconductor would need to be flawless, since any perturbation in the motion of any one of the ions would be passed on to all the others. That would surely create a chain reaction that ends the synchronized motion. I assume it would also be sensitive to any outside magnetic field, speeding up or slowing down in response to any non-uniform field. What if you make it a square? Would this still work? I'm guessing it wouldn't work as you'd get a change in potential between ions around the corners. You'd also not have a space/time crystal, as such a square configuration would not constitute a perfectly periodic/crystal-like structure. Since superconductors exclude magnetic fields (see: London penetration depth) that would not be a problem unless you use very high magnetic fields. There is a relation between Tc and external magnetic fields. and it unlocks another mystery of what is possible in our universe. Very symmetric structures allow us to look into what happens when you break symmetries - which is important for SUSY research. So there might be applications in that direction. 1) it is further evidence that the theory it is based on is correct. You are incorrect that it isn't even a theory. The idea is actually based on theory, and if someone is able to carry out a demonstration then it confirms that the theory is correct. If the demonstration from what is expected based on theory, then they would know the theory is incomplete or wrong. 2) If confirmed, then people can look at how it might fit into cosmological observations such as the relativistic jets that shoot out from active black holes, or the magnetic fields of quasars. 3) if the idea is possible, then observing its behavior in an experiment might expand our understanding of superconduction. Observing new physical phenomenae that we've never seen before often leads to new discoveries with practical applications; the laser, for example.. or even fire lol. But magnetic fields do penetrate into the superconductor, just not very far. So that precludes the possiblity of using a microscopic array of these for dense data storage. Rings that small would be overwhelmed by ambient magnetic fields. Only at macroscopic scales is the superconductor free of magnetic fields in its interior. But magnetic fields do penetrate into the superconductor, just not very far. So that precludes the possiblity of using a microscopic array of these for dense data storage. Picture a hollow superconducting ring - and the ions moving around as a supercooled gas on the inside. It would be like thoes experiments with superfluid helium, where the viscosity drops to zero and you get self sustining eddies. 4d crystal? How bout making a this into a metamaterial and the flow of reversing time space? Bowler: "as crystals are wont to do" means "as crystals are prone to do". The interesting thing about 4-D crystals would be that they could have many more different types of symmetry than 3-D crystals. Unfortunately the proposal is only for a 2-D crystal, but it will have some interesting differences from a spatial 2-D crystal. The curious difference between time and space is that their squares have opposite signs, which when using the pythagorean theorem to measure distance can lead to zero distance even when both the duration and the spatial distance are positive - as is the case for light rays - the 4-D distance is always zero for light, no matter how far it travels. A 2-D crystal with such a "mixed signature" could have some very counter-intuitive properties, though I can't imagine what they might be. can a crystal be grown with these attributes? No, because if you grow a crystal then you have a fixed lattice. For this space/time crystal to work you need moving ions. Phenomenologically I don't see any problem with this assumption. We already know, that the electrons revolve the tiny metallic rings for ever. This is the manifestation of zero-point energy (i.e. the Brownian motion of the particles forming the vacuum). But why to call such a rings the "time crystals"? Will it helps us to some applications/predictions? I would like to point out that adding a fourth dimension is purely theoretical at this point. Yes it fits in a few equations but that's about it. A lot of stuff works on paper but in practice is just unpractical. How exactly do we add the 'movement in time' dimension to a crystal (besides moving forward in time with us) unless we have already figured out how to move in time? I hope for the sake of this crystal that there is a 4th dimension being movement in time that we can one day manipulate. Never thought something called "Space-Time Crystal" would be so boring. An infinitely running clock... yawn. An infinitely running clock... yawn. If something like an INFINITELY running clock bores you then you don't deserve this marvelous universe we live in. I have to say, this doesn't sound useless to me. It sounds like something which could have applications analogous to lasers, though I'm not sure quite what those applications would be. Maybe a "laser" for phonons? The fact that the universe is marvelous has nothing to do with technology man develops. I think I can not be interested in whatever technology I choose, thanks. since when did we have experimental proof of spacetime? or is this supposed to be it? I think I can not be interested in whatever technology I choose, thanks. Sure. But that just means you don't understand what such breakthroughs mean (or what future applications they could herald). You're probably one of the people who goes "Higgs discovered? So what. But a new shiny tablet computer is awesome!" You'd really better off at engadget or similar websites than here.